This is a sponsored conversation written by me on behalf of Battistoni Italian Specialty Meats. As always, all opinions are my own and I only work with brands that I use, love and recommend. This also post contains Affiliate Links. Please see the disclaimer here. 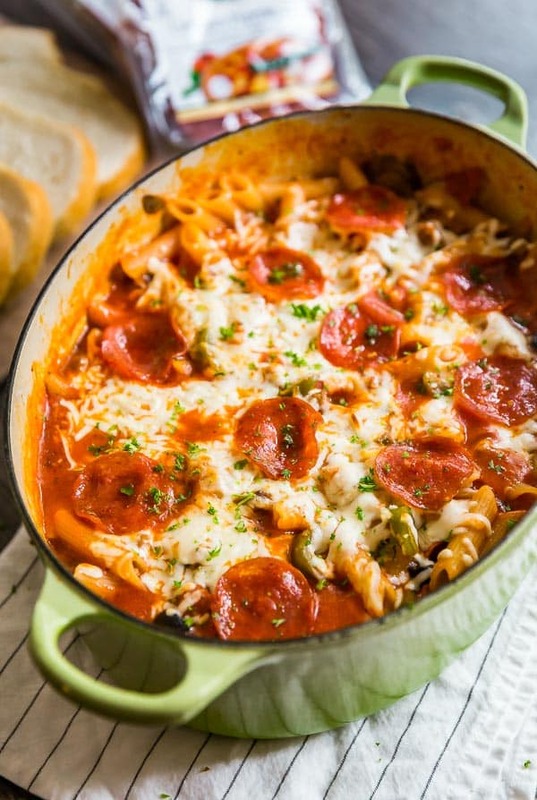 Supreme Pizza One Pot Pasta: minimal clean up with maximum flavor. Your pasta night will never be the same. Here in Western New York, we have a thriving culinary scene. New restaurants and eateries are popping up everywhere. They are pushing the boundaries of new and creative ways to present food. Even better, is the fact that some of my favorite brands and products are actually produced locally. So I still get to stay loyal to the brands I love while being able to “eat local”. It’s always a pleasure getting to introduce you guys to these foods and brands that I love along with great recipes to use them in. I’m especially excited about today’s post because Battistoni Italian Specialty Meats, which is local to Buffalo, NY, recently released their All-Natural Pizzeria Pepperoni to 93 different Wegman’s store locations. This makes me pretty happy because now I can find my favorite pepperoni variety at one of my favorite grocery stores! They are actually the first in the pepperoni category to have a product with a clean formula, cured naturally with celery powder. This replaces the chemical sodium nitrite in processing (aka the bad stuff the World Health Organization warns against). The genius part of it all, is they managed to do this while still maintaining the good stuff like spices and fat for flavor in the traditional way; hand-blended spices for 86 years! So you get a delicious and mildly spiced pepperoni (read: perfect for kids!) without the nitrates or BHA / BHT! Battistoni is the largest maker of authentic Italian dried meats in New York state. There’s only a small number of plants in the entire United States that craft small batches this old world way from Europe as opposed to factory processing. So you’re getting artisan-crafted meats that have the same care and precision as the traditional Italian way. And it all happens right here in my own proverbial backyard! A huge goal for Battistoni is earning the trust of their consumers, the same way a mom would trust her favorite brand of bread or milk. This can be difficult considering the general distrust that the public has for “processed” foods. But between their perfect blend of pure and delicious flavors, a healthy amount of nostalgia for their Italian ancestry and awesome advances in food science, Battistoni is making great strides in achieving that goal! Who wants to deal with extra dishes?! 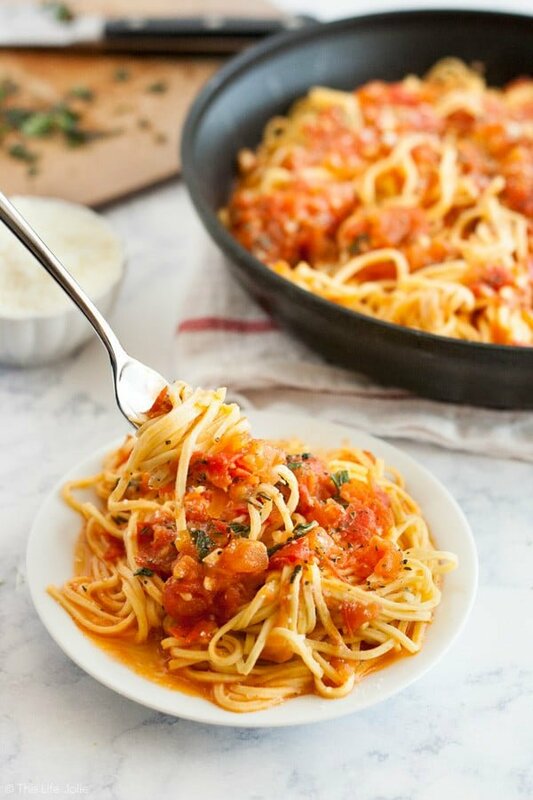 One Pot Pasta to the rescue! What kind of food blogger would I be if I didn’t share a mouthwatering recipe to illustrate a tasty way that I used my Battistoni All-Natural Pizzeria Pepperoni?! I love a good one pot pasta. There’s nothing better than a meal that involves minimal clean up but still tastes fantastic! And this Supreme Pizza One Pot Pasta delivers! Penne pasta in a zesty tomato sauce! This pizza pasta gives you all the fixings of the Supreme Pizza of your dreams: onions, peppers, olives, Italian sausage, garlic, olive, alllll the cheese and the absolute best All-Natural Pizzeria Pepperoni! All of this in your favorite pot and you’ve got yourself a dinner that is sure to please. 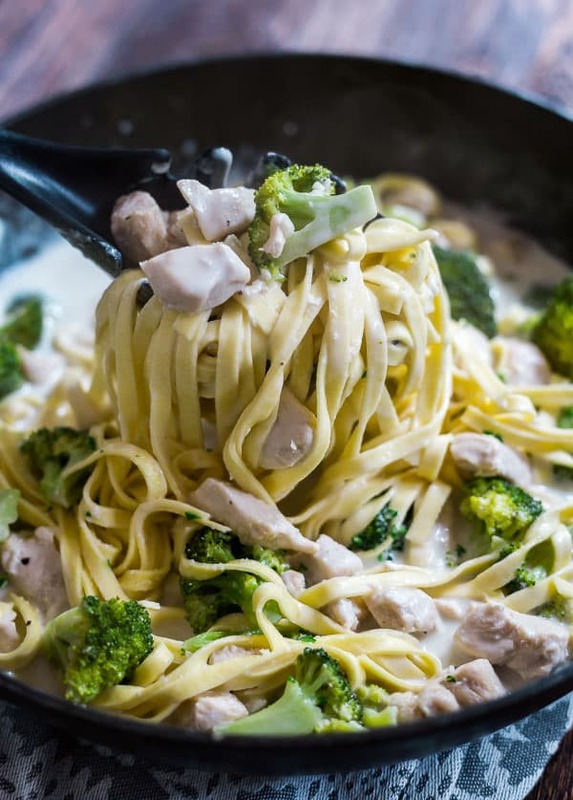 Stir often– you don’t want that glorious pasta to stick to the bottom of your pan! Keep an eye on the heat– every stove and oven is different, so another good way to avoid sticking is to keep an eye on your heat and adjust accordingly. Don’t fear the water– my first few tests included less water but I was worried about drowning my other ingredients, but each time it was way too dry. I found the magic number with 3 cups of water. It will feel way too liquid-y at first but have a little faith, because it will cook down and much of the liquid will be absorbed by the pasta. Know when to remove the cover– I like uncover it for the last 3-5 minutes of cooking to let a bit of extra liquid evaporate just a little bit. 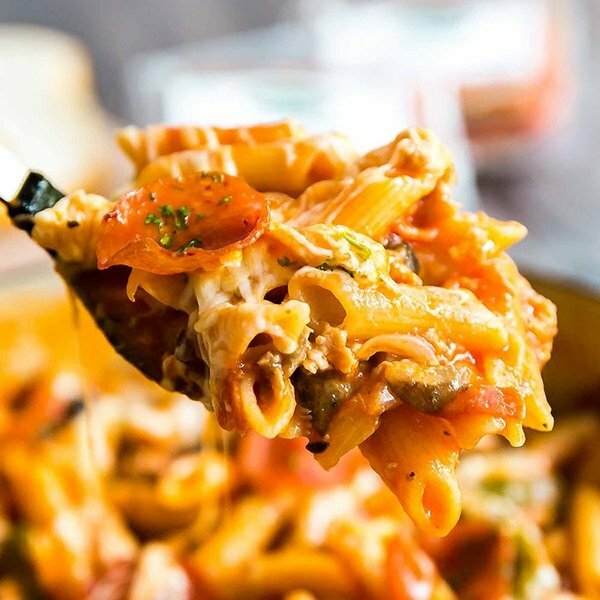 Supreme Pizza One Pot Pasta: This recipe is so easy to make and since it's made in only one pan the clean up is minimal. 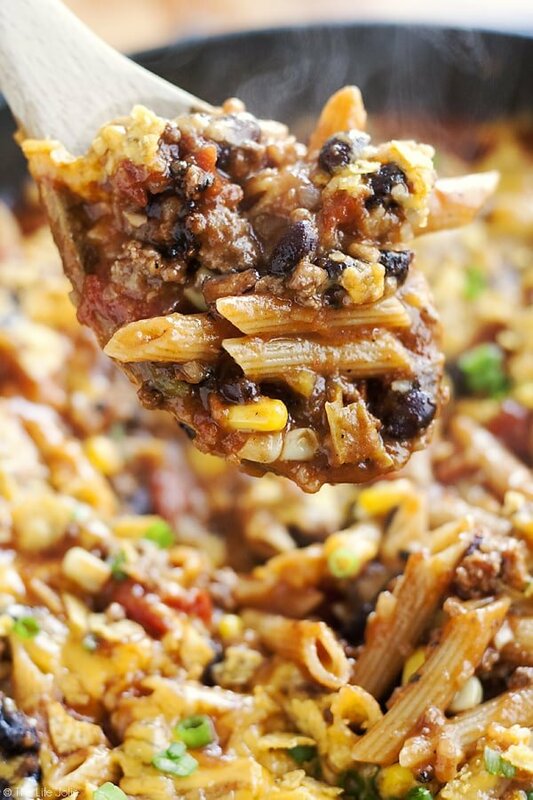 It's the best weeknight meal made with penne pasta and all your favorite supreme pizza toppings, this will be a hit with the whole family including your kids! Heat oil in a deep heavy-bottom, oven-safe pot over medium heat. Add sausage to the pan and break it up quickly with a wooden spoon. Add onions, peppers, garlic and mushrooms and stir to combine. Saute until the sausage crumbles have browned, stirring frequently for around 10 minutes. Add the pepperoni and olives to the pan and saute for 1-2 minutes. Add sauce, water, Italian seasoning, salt and pasta to the pan and stir to combine. Once it's boiling, reduce the heat to a medium low, cover and simmer for 10 minutes, stirring periodically. Remove the cover and simmer for and 3-5 minutes stirring here and there. Stir in 1/2 cup of shredded Mozzarella cheese and sprinkle the remaining cheese on top of the pasta. Place a few more whole pieces of pepperoni on top of the cheese and broil for a few minutes until the cheese is melted and bubbly. Top with parsley and Romano cheese and enjoy! You can also use hot Italian sausage if you want this to be spicy. November 2, 2017 at 11:44 am I've been loving one pot meals lately! The less clean up the better. This one sounds like a winner! November 3, 2017 at 11:38 pm Me too- all the taste with wayyyyyy less hassle! November 2, 2017 at 11:45 am I saw this on Instagram earlier and was swooning over how glorious this looks!! Just printed the recipe because this needs to happen in my kitchen! So many amazing flavours AND in one pot! What could be better?! November 3, 2017 at 11:38 pm Thanks Annie! I hope you love it as much as we do! November 2, 2017 at 11:51 am This is definitely a big bowl of comfort Right here! I love simple comforting dishes like this! November 2, 2017 at 11:52 am Oh my goodness! This pizza pasta pot!! My family would love it. Saving to try. November 3, 2017 at 11:36 pm Thanks Suzy- Enjoy! November 3, 2017 at 11:35 pm Thanks Traci! I hope you love it! To be fair, testing is more fun with you love all the ingredients as much as I do with this! November 4, 2017 at 7:25 pm How much pasta does this call for? 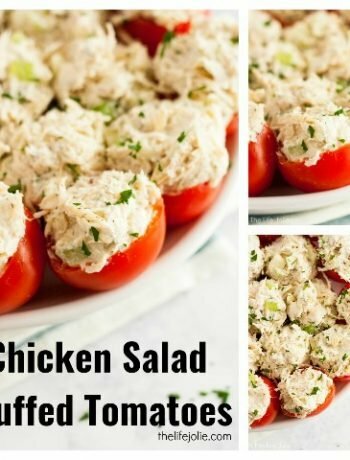 Can’t wait to try this delicious recipe!! November 4, 2017 at 8:40 pm 1 lb. Sorry, I missed that when typing it out- I'll go update it now :) Enjoy!! November 5, 2017 at 8:00 pm We made this tonight and it was not only easy, but absolutely delicious! The kids loved it as much as we did. Comfort food at its best. Thank you!! November 6, 2017 at 11:24 am Hi Lisa- Yay! You totally made my day- I'm so glad you loved it!